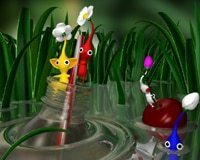 It was way back at E3 2008 that Shigeru Miyamoto confirmed that he was hard at work on a further instalment within the adored Pikmin series. Yet, nearly three years later, it would appear that whilst such a project was believed to be in the works for the Wii, it may in fact being heading to the Nintendo 3DS instead. UK retailer Zavvi has listed a Nintendo 3DS software product known only by the name of ‘Pikmin,’ although additional information that is included perhaps proves that it should only be taken with a pinch of salt – even if we did wish it were true!